Home > News > Discovery, TG4, CJ send Earth to Luna! Discovery, TG4, CJ send Earth to Luna! Discovery, TG4 in Ireland and South Korea’s CJ ENM are among the broadcasters to have picked up science toon Earth to Luna! from Brazilian prodco PinGuim Animation. 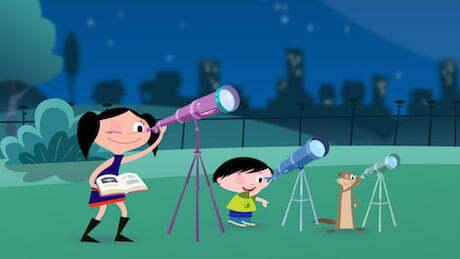 Targeting kids aged three to six, the show follows a six-year-old girl who is passionate about science. The series is currently in production for its fifth season and has aired on Sprout in the US, Tiny Pop in the UK, RT in Hong Kong, Minika in Turkey, as well as being picked up by streamer Netflix earlier this year. Discovery, which has already reordered season four, has taken the show for its MENA services while CJ has acquired it for its English-language channel English Gem. Elsewhere, Czech pubcaster Česká Televize and flight services Emirates and Azerbaijan Airlines have also picked up the show. Distributor Monster Entertainment will be launching season four of the series at MipJunior in Cannes next month.